Handmade in the United States, our Golden Gate Bridge mugs will make a great addition to your kitchen. The tall and narrow design of these mugs reduces surface area contact between your warm drink and the cool air, keeping your drink warmer, longer. 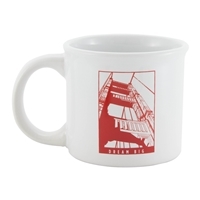 Take home a lasting memory of your trip to San Francisco with our "I Crossed The Golden Gate Bridge" Mug. This mug features a stunning graphic of the Golden Gate Bridge printed in bold color. In our humble opinion, Coffee just tastes better when you drink it out of a Golden Gate Bridge mug! Cheers! Celebrate one of San Francisco's most beloved icons with our Golden Gate Bridge 16 oz. Pint Glass. Featuring a contemporary design of the world-famous silhouette printed in International Orange, this eye-catching glass is sure to be the talk of the party.